Tue., 16 Jul. - Wed., 17 Jul. Situated near the airport, this hotel is 2.1 mi (3.4 km) from Meadow Lark Country Club and 3.1 mi (5 km) from Four Season Arena. The History Museum and Holiday Village Mall are also within 6 mi (10 km). Situated near the airport, this hotel is 2 mi (3.2 km) from Meadow Lark Country Club and 3 mi (4.8 km) from Four Season Arena. The History Museum and Holiday Village Mall are also within 6 mi (10 km). Situated near the airport, this hotel is within 6 mi (10 km) of Meadow Lark Country Club, The History Museum, and Holiday Village Mall. Four Season Arena and Valley View Garden Golf are also within 6 mi (10 km). 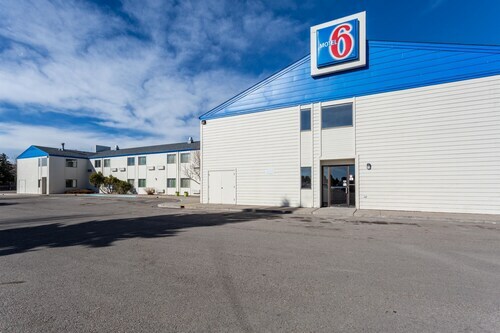 Situated near the airport, this hotel is 0.8 mi (1.2 km) from Meadow Lark Country Club and within 3 mi (5 km) of Four Season Arena and The History Museum. Holiday Village Mall and Great Falls Convention Center are also within 3 mi (5 km). Situated in Great Falls, this hotel is within 3 mi (5 km) of Meadow Lark Country Club, Four Season Arena, and The History Museum. Great Falls Convention Center and Holiday Village Mall are also within 3 mi (5 km). Located in the heart of Great Falls, this motel is within 3 mi (5 km) of The History Museum, Holiday Village Mall, and St. Ann's Cathedral. University of Great Falls and Paris Gibson Square Museum of Art are also within 6 mi (10 km). Situated in Great Falls, this hotel is within a 15-minute walk of The History Museum and Great Falls Convention Center. Four Season Arena and St. Ann's Cathedral are also within 2 mi (3 km).